In 2016 the diabetes community, both online and off, made a huge difference for children with type 1 diabetes in developing countries. This year’s Spare a Rose campaign raised $25,331 from 537 donations, saving 422 children. Four hundred and twenty-two children. 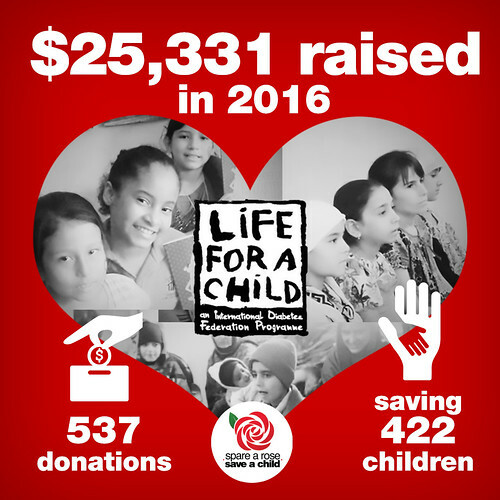 Through the endless generosity of people in this community, donating their time to share the message, their ability to rally support, and their willingness to give both emotionally and financially, we helped save the lives of 422 children. 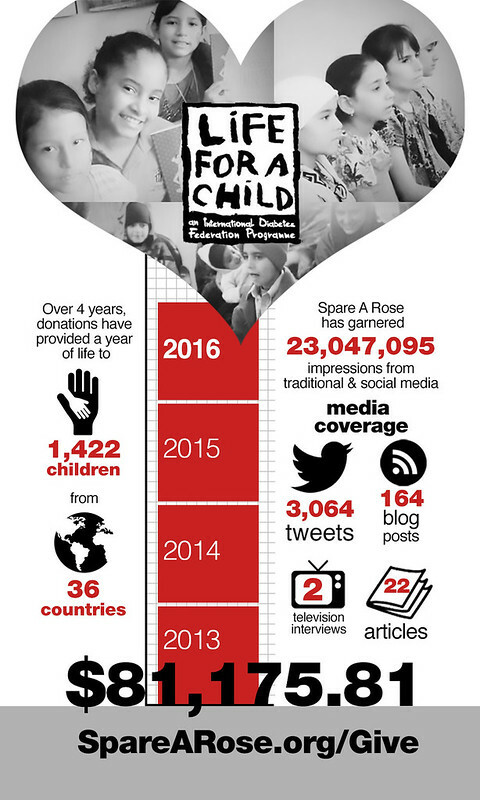 Since the beginning of the Spare a Rose campaign back in 2013, we’ve directly influenced the lives of 1,422 children in 36 countries. This is a big deal. Each number in that 1,422 represents a single kid, no longer struggling for access. Imagine if that were your kid. Imagine if that were you. Thank you to the companies who participated and matched donations, who shared it with their employees, and who threw their social media muscle behind the effort. Thank you to the individual members of the DOC who, far and wide, shared the donation link and their reasons for believing. Thank you to Life for a Child for providing a way for small change to make a big difference. And thank YOU. This campaign is effective because everyone owns it, and everyone benefits from it. The lives of these children are improved because of you. You shared the donation link. You told your coworkers. You reached into your own pocket and spared five dollars. Every voice matters. The difference we made as a community, for our community, is because of you.